Just a few days ago we showed readers a leaked image of two upcoming BlackBerry smartphones, the BlackBerry Z30 (formerly known as the BlackBerry A10) and the Z15. Today we have a further leaked image of the BlackBerry Z30 to share with readers that depicts it alongside the BlackBerry Z10 and Q5 and therefore gives some idea of dimensions. Our previous report of the flagship BlackBerry Z30 also contained an image of the Z15, thought to be the first BB10 slider phone, although we were less convinced by the authenticity of this image. Leaked specs so far for the BlackBerry Z30 include a 1.7GHz Qualcomm dual-core processor, quad-core Adreno GPU, a 5-inch display with 1280 x 720 resolution, 2GB of RAM, an 8-megapixel rear camera and a 2800 mAh battery. 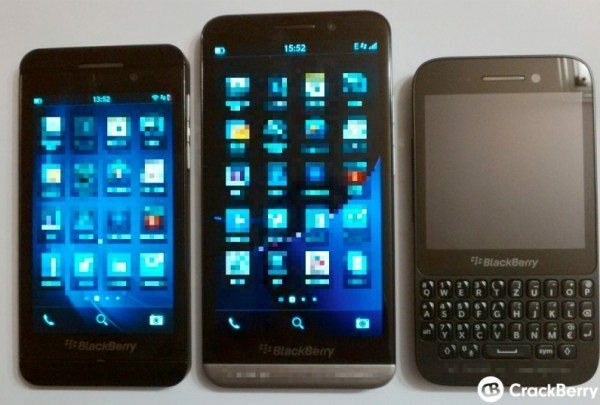 The new leaked image (below) of the BlackBerry Z30 clearly shows the larger size of the Z30 when compared with the already released Z10 and Q5. This is no surprise of course as it has that 5-inch display when compared with the 3.1-inch display of the Q5 and 4.2-inch display of the Z10. It’s thought that the BlackBerry Z30 will release running BlackBerry 10.2 although a new quick settings menu looks to be coming with an update that leaked at the weekend. Another thing evident from this latest image is that the Z30 has 5 rows of icons compared to the 4 rows of the BlackBerry Z10. We’ll be looking out for more news on the BlackBerry Z30 and the rather more mysterious BlackBerry Z15, so why not head back to us from time to time for the latest. Are you hoping to find out more soon about the BlackBerry Z30 (aka A10)? Would you be interested in purchasing a BlackBerry smartphone with a larger display?